I’m a sucker for great packaging and have been know to buy a product or two just because of it! The packaging is really your first impression of a brand, a touch point that connects you to it in one way or another and for me. vintage always does the trick. So what is this type of packaging saying? First and foremost it looks FUN, and whats funner than makeup? Cosmetics can help us step out of the ordinary, even if its for just a night. There is a reason lipstick always sells in good times and bad! 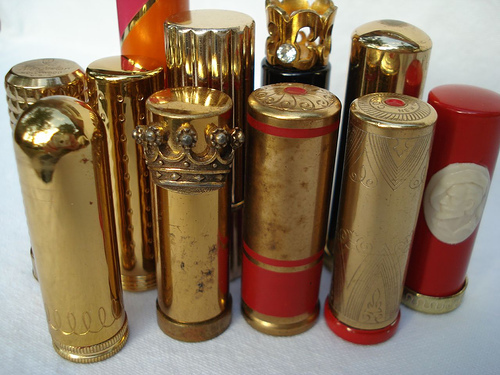 How beautiful is this collection of vintage lipsticks? But obviously the product inside has to be more than fun, so what does the outside say about the inside? Vintage works is because it’s telling you the product is tried and true with history behind it. Ahh the “good old days”! When everything seemed better. Such an excellent post! I’m very guilty of buying products simply because of the glamorous packaging! Oh my goodness, yes Tom Ford is always a given! I keep my Black Orchid lipstick on my vanity because I just looove looking at it! Plus, I was roaming around Anthropologie and found this Albeit lipstick in the shade Claret that was packaged too beautifully to ignore! I’ll be sure to post a picture some time soon! Oh I will have to look for the Albeit lipstick! Thanks for the tip.